Commonly used for : Asset Financing, Working Capital Financing, Revolving Credit, Home Financing, Current Account, Savings Account. One of the favourite questions I receive from academicians was “Why don’t Islamic Banks offer Musharaka-based financing?”. It is a question that frustrates me endlessly as I think as a Bank set-up for financial intermediation, a Musharaka-based financing structure is ill-suited in the banking model. The main perception by academicians is that Musharaka or Mudharaba represents “pure Islamic Banking structure” and therefore should be promoted as a priority. Now that is another different discussion, which I have written about sometime back. SO, WHAT IS MUSHARAKA FINANCING? Musyaraka refers to “equity partnership”, arriving from the word “Shirkah” or in Malaysia we commonly know it by the word “Syarikat”. It means, a group of investors pool their money (as capital), and jointly enters into a business venture as partners, be it finance or expertise for the business for the purpose of making a profit. A leader or manager may be appointed to run the business. All the partners agree on a profit sharing ratio for profit they intend to share, and this is negotiated up-front based on what they contribute (money, skills or otherwise determined). However, this also means that the partners agree that any losses, they will share but limited to their capital contributions. Musharakah Mutanaqisah, in the Malaysian context, is not an equity partnership arrangement, although some Banks would like to think so. A Musharaka structure where real equity is concerned, carries valuation risks where the equity cannot be principally guaranteed. In a pure Musharaka, if there is a valuation loss, the Bank and customers share the losses. In Musharakah Mutanaqisah, this does not happen. Why does the above not happen? It is because the main contract of Musharaka Mutanaqisah is not Musharaka, but Ijarah (Leasing) instead. This is the main operating contract, where the customer pays installment which consist of 2 elements i.e the rental for the right to use the usufruct (benefit) of the property, and staggered purchase of “equity” from the Bank over a period of time (akin to principal payment in a Murabaha). Wa’d (Promise) for the acceleration of equity purchase in the event of default, usually via Letter of Undertaking. Service Wakalah (Agency) where the client undertakes to maintain and keep in good working order the asset under lease to protect its usufruct. The use of “Letter of Undertaking” removes the Valuation Risks from the Bank and effectively converts the arrangement into a debt-financing arrangement, where the risks to the Bank is Credit Risks. As such, the capital charge (and classification under the risk-weighted assets) revert to the familiar home debt financing weightage of 50%-100%, instead of the capital charge of 200% to 400% for a “pure-risk” Musharaka structure. Musyarakah is often touted as the “pristine” Islamic structure and many scholars prefer to support the development of this structure. I do admit that sometimes I do feel that there is a huge value in developing Musyarakah. As an equity partnership structure, where both parties or partners share the fruits of their labour. But sit back and assess whether the current banking structures are geared up to handle a structure of risk-sharing and capital non-guarantee and equity risks, you will realise that as a Bank, maybe we are ill-equiped to handle such risks. The property is purchased at $1.0 million with a monthly rental of $4,000. Each month, the partner shares the profit ie from the rental. gets $2,400 (60% share) and the other partner gets $1,600 (40%) inclusive of his manager’s fees. However, the following month there was a loss of $2,000. The share of losses for Mr A is $1,400 (70% equity x $2,000) and Mr B share is $600 (30% equity x $2,000). If the partners agree to dissolve the partnership, the assets are divested and the amount will be returned to the partners based on market valuation x share of equity in the Musyarakah venture. In theory, Musharaka is very much similar to what you see in the real world as joint venture partnerships, venture capitalist or investment platforms. Not a lot of institutions are geared up to handle Musharaka, due to its inherent risks that if there are losses, the investors lose their capital. Banks are not set up like that. 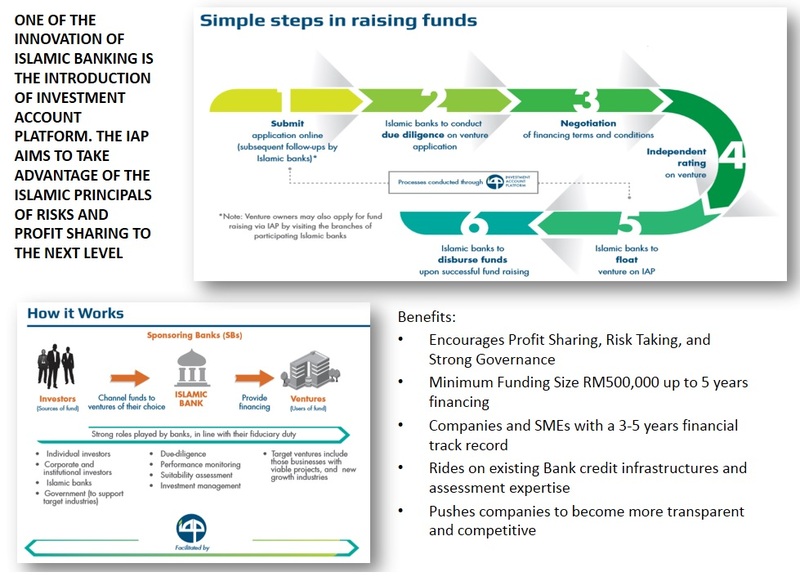 In Malaysia, this is pretty much still greenfield but there is an experiment happening now with the introduction of Investment Account Platform (IAP) which, if you strip away its layers, is a working Musharaka platform. On this platform, “investors” assess a project and if they are comfortable with the risk profile and expected returns (and potential losses), they will “invest” into the business (becoming a partner) with the hope of generating above average returns (from the above average risks). At the end of the expiry period, the project will realise its “profit” and distribute accordingly based on the agreed Profit Sharing Ratio. If there are losses, the Capital is diminished according to each partner’s contribution. My view: Musharakah Financing is unsuitable in a banking environment due to the risk to Shareholders Funds and Depositors. It requires a set of shareholders and depositors of a different risk profile i.e. someone willing to undertake “medium to high risk businesses”, instead of the standard banking “financial intermediary” model where the “maximum” returns are expected from the least amount of mitigated risks. 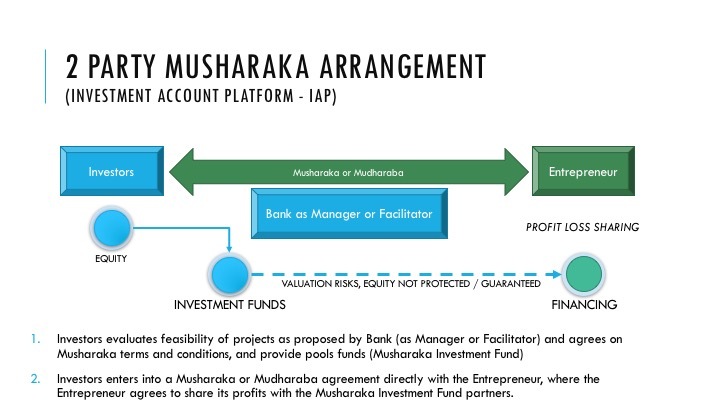 Under the Investment Account framework, Musharaka is also listed as an “Investment” product where the customer can be offered a Musharakah Investment Account (as partner) into an investment endeavour where Capital is not protected. In this structure, the customer is an “investor” into the Bank (which is also an “investor” in the structure) that also acts as a manager to “invest or finance” into an economic activity. The Bank may earn a fee as the manager and also earn a return on its own equity (Capital) whenever there is a profit upside. For me, I am unwilling to clearly differentiate both Musharaka Financing and Musharaka Investment Account, as I think they are just different sides of the same coin. Under Bank Negara Malaysia guidelines, to offer Musharaka Investment Account to customer, the Bank has the duty to fully disclose the intended “investment or financing” to the customer (as investors) including the forecast of returns and its risks. This seems like the customer is investing directly into the Musharaka arrangment, where all the disclosures on the financing are provided. 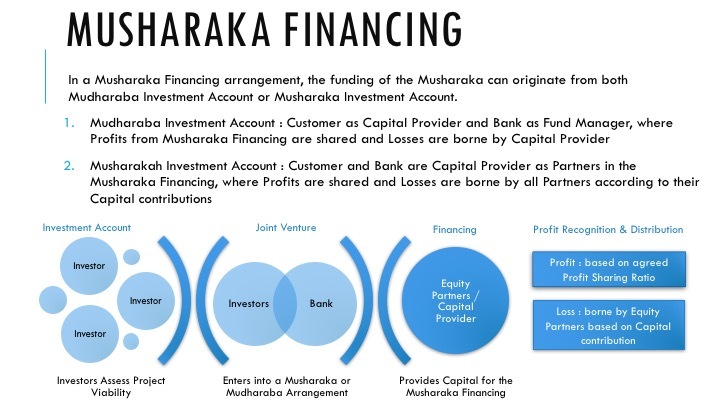 As mentioned earlier, I don’t differentiate between Musharaka Depositors and Musharakah Financing, because in my view, Musharakah Depositors are the same investors who are willing to take a risk into an equity-based, non-capital protected “Investment or Financing”. These investments are dependent on performance and these can be into either 1) Investment Instruments such as a Mudharaba Investment Certificates, or 2) Equity-based Financing portfolios such as Musharakah Financing, Mudharabah Financing or even Ijarah (Leasing) structures. 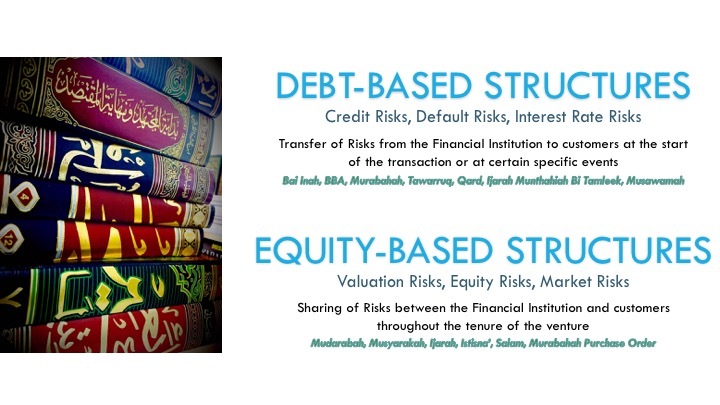 There is really no point if you link Musharaka “Investors” to an asset which is based on debt (such as Murabaha, Istisna’a or Tawarruq), where the Capital is protected / guaranteed. The role of a Depositor (Investor) in a Musharaka arrangement is one of partnership, as their investment should be linked directly into a Musharaka Financing structure. 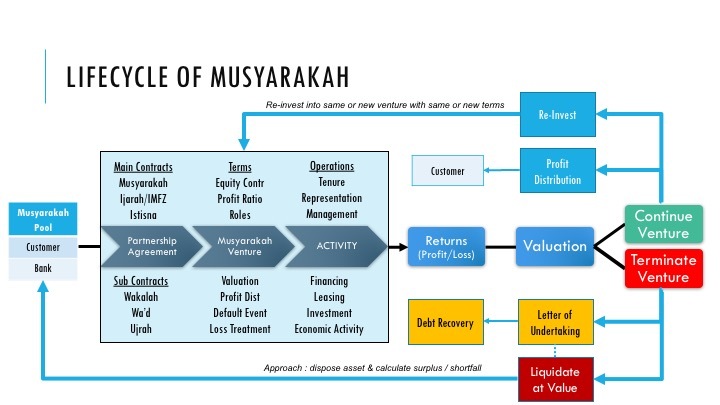 Theoretically, you can also link a Musharakah Investment product to a Mudharaba Financing structure, but what is the point of entering into a Musharaka agreement when it will be tagged into a non-Musharaka Financing structure? It is logical to tag a Musharaka Investor for a financing structure which is based on equity partnership. In Malaysia at least, the Investment Account guidelines provides for a regulated framework where a Musharaka structure (financing) can be adequately funded by an Investment Account under the contract of Musharaka. The disclosure requirements, including the Product Disclosure Sheet, looks as good as a financing Term Sheet you get when assessing a proper investment or financing proposition. The details are sufficient enough for a Musharaka “investor” to make a decision whether or not to enter into the Musharaka arrangement. This is also consistent with the requirements you see in the Investment Account Platform (IAP) introduced by Banks Negara Malaysia in 2015. 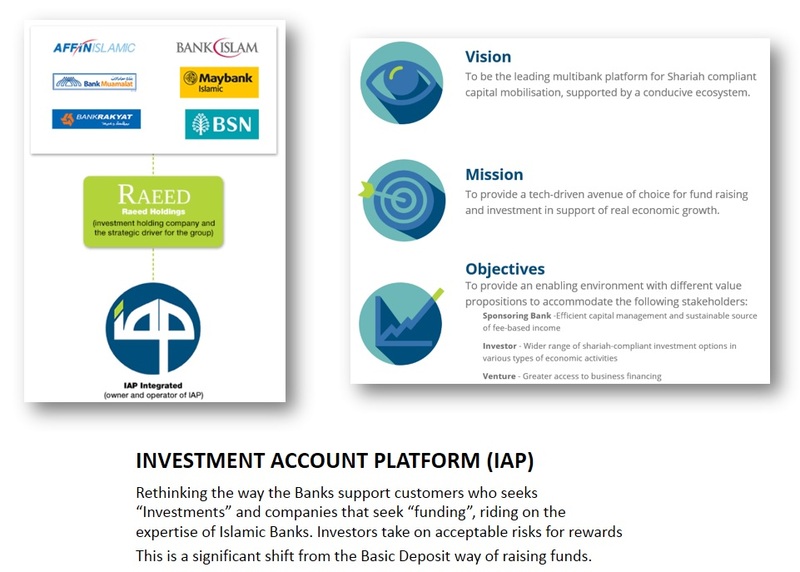 Therefore in the context of Malaysia, the Musharaka arrangement can be funded through Investment Account via Islamic Banks, or directly from public investors straight into the businesses seeking equity via the Investment Account Platform (IAP). Clearly, in a financial intermediation function, debt financing structures are the right fit. Equity-based structures implies a different approach when dealing with financing; the risk profile is significantly higher and the need of adequate capital also rises. My view is that Musharaka Financing should not fall into a Financial Intermediation role for banks; instead it should be an “Equity Intermediation”, if a bank is willing to undertake the role of partners or managers in an equity arrangement (where there is profit and loss sharing implications) instead of just debt owners. IN REALITY, HOW MANY “PARTNERS” ARE INVOLVED IN MUSHARAKA? Depending on which institutions you go to, I believe it is workable either in a two-party Musharaka arrangement, or a three-party arrangement. 2 party partnership arrangement is where the 2 parties enter into a Musharaka agreement i.e. the customer (as Investor) and the entrepreneur/businesses (as the equity seeker / business partner). A Bank may enter into the arrangement but not part of the Musharaka agreement. Therefore, the Musharaka agreement involves the investor investing directly into the business activity as an equity contributor, to be managed and run by the entrepreneur. The Bank may just provide a service (as Manager or Facilitator) to monitor and manage the whole Musharaka arrangement (for a fee, of course!). This structure is already in existence in the Investment Account Platform (IAP) where the Bank facilitates the arrangement of businesses being equity-funded by retail investors, including providing credit assessment reports and risk profiling (fiduciary duties only). 3 party partnership is where the Bank comes in as an intermediary (equity intermediary?) where the first Musharaka is between the Bank and the Customer to onward invest with another party based on profit sharing basis. Once the funding has been secured (as Musharaka Investment funds), the Bank then enters into a back-to-back Musharaka financing arrangement with another business, where the returns will be based on the performance. This intermediation role is theoretically possible, but perhaps cumbersome to execute. However, this structure is also catered for in the Investment Account framework in the guise of Restricted Investment Account (RA) where the financing portfolio is match-funded in terms of amount and tenure to the customer’s Investment Account. In summary, once a certain “financing” is identified, the Bank seek investors to fund the financing directly, via the Bank as intermediary. So far, I have not seen Banks operating this structure with “retail” customers, but RA is widely used via the Profit Sharing Investment Account (PSIA) arrangement where another financial institution (usually a parent entity) provide funds to finance a corporate financing structure of a large client. It is matched funded against the tenure and amount, and the returns are flowed directly to the investor and the Banks (as intermediary) retains a small profit sharing portion for managing the arrangement. CAN THE STRUCTURE CHANGE FROM ORIGINALLY MUDHARABA TO MUSHARAKA? A Bank (assuming the Bank is comfortable with equity financing and the Profit Loss Sharing structures) identifies a good Corporate client seeking equity. For example, a Green-Tech company with new technology. Following assessment of its potential, the Bank decides to provide equity (capital), based on Mudharaba where the Bank undertakes the risks (and its rewards) for 100%. The Bank (now as Rab-Ul Mal ie fund provider) depend on the client (as Mudharib ie Manager) to manage the funds for the growth of its green-tech business. The Bank is expecting its share of profit from the agreed Profit Sharing Ratio. Now, a few years into the Mudharaba arrangement, the Bank feels that the returns based on Profit Sharing Ratio has fallen short of the Bank’s expectations. Or maybe the Bank now have a view of the market and downgrades the potential of that green-technology. There is now a need to diversify the portfolio and/or reduce the Bank’s exposure to the business. The Bank intends to divest its Mudharaba from 100% capital provider to maybe 60%. The Bank now opens up their Mudharaba share of 40% to other investors to “buy into”. New “partners” are brought in and the risks are now shared. As far as the Green-Tech company is concerned, the funding arrangement is still Mudharaba agreement but the Mudharaba is now funded by multiple parties, not just the Bank. The Bank, however, may sign a Musharaka agreement with the other partners, outlining the terms of the Profit Loss Sharing and their equity contribution (as well as scope as equity partners). This flip from Mudharaba into Musharaka is not something common, but when my team was developing the Investment Account product a few years ago, Bank Negara Malaysia cautioned us on the possibility of the flip happening from Mudharabah Investments into Musharaka Investments, where originally we have taken deposits from clients on the basis of Mudharaba. When a portion of customers redeem or exit the Mudharaba Investments (the structure allows it with a little breakfunding charge), ideally the outgoing funds should be taken over by another investor. In the event there is none, the Bank which is obliged to return the Mudharaba Investment to the depositor, will “advance” the Bank’s own funds for the redemption; thus becoming an “investor” themselves. This changes the nature of the pool of funds from Mudharaba into Musharaka and the implication to the Bank is that they are now invested into a “principal non-protected investment” where the risk weightage of the funds have changed. We therefore had to manage the “financing” leg where the Mudharaba funds are funding a portfolio that is fairly liquid or easily decoupled.